Designed for use outside communal changing areas, the freestanding Premier Boot Wipers are extremely sturdy and hard-wearing, manufactured from 50.8mm diameter steel and polyester powder coated matt black. 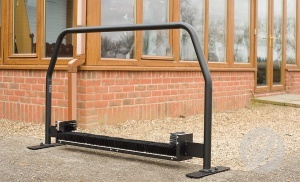 Available as a fixed, freestanding or socketed boot wiper. Available in 2 sizes 1.1m & 1.75m long. 1m high unit with bottom and side brushes. 2 internal shoe scraping plates for added safety. Complete with two freestanding plates and fixings.